It’s no secret that Victoria in Canada’s British Colombia is a premiere location for aspiring expats. The region already claims 3.65 million tourists annually, who pour over a billion dollars into the city’s economy each year alone. It’s easy to see why, as this beautiful city located on Vancouver Island has one of the most idyllic settings in all of Canada. Furthermore, although the city is located in the North American Pacific Northwest– which typically has a climate of mild, damp weather– the region around Victoria is sometimes classified as a Mediterranean climate due to its usually dry summers. And the city’s downtown area is typically hopping come summertime. Many night clubs, theaters, restaurants and pubs are clustered here, and much larger regional public events often occur here too. In particular, Canada Day fireworks displays and Symphony Splash and Victoria Electronic Music Festival concerts draw tens of thousands of Greater Victorians and visitors to the downtown core. 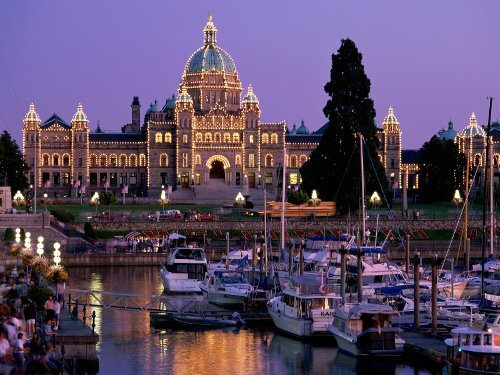 Yet despite the fact that the city is such a popular escape destination for foreigners and locals alike, its year round population is a homely 80,000 or so, and the Greater Victoria area, when totalled in full, has roughly 330,000 inhabitants. Victoria may seem particularly attractive to aspiring expats who are looking for somewhere to retire. The city has large retiree communities, and some 6.4 percent of the population of Victoria and its surrounding area are over 80 years of age—the highest proportion for any of Canada’s metropolitan areas. Retirees are drawn to Victoria for many of the same reasons it is attractive to tourists of all ages: its mild climate, beautiful scenery, year-round golf season, and generally easy-going pace of life. All in all, Victoria is one of the top places in North America to expatriate or retire to.